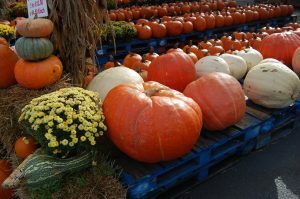 It’s that time of year – no I’m not talking about the Christmas decorations that have been in stores since July – I’m talking PUMPKINS. You find every size, shape, and color at your produce stands or grocery stores then you take them home and work your magic. Whether you are baking with them, roasting the seeds, decorating your front porch, and even adding paint and glitter to them. I’m fortunate enough to have a great produce stand just a few miles from me – Linda’s Produce. 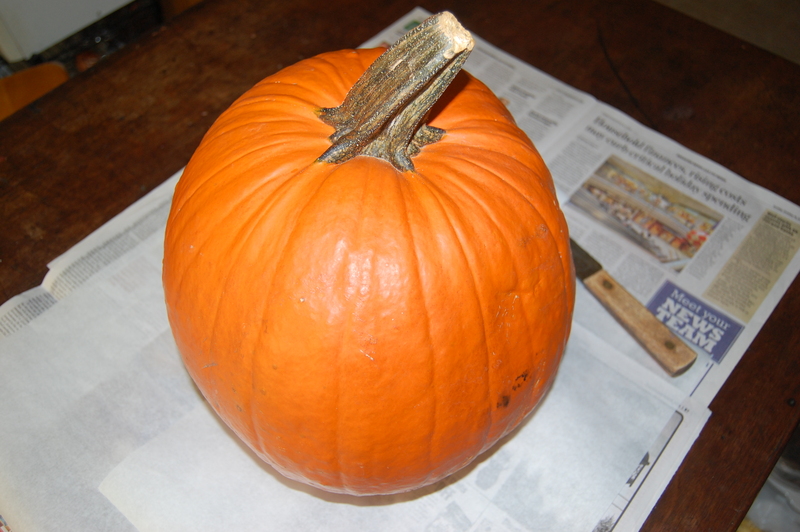 Don’t ever hesitate to ask questions if you are wondering the best pumpkin for a project, cooking, or taste. 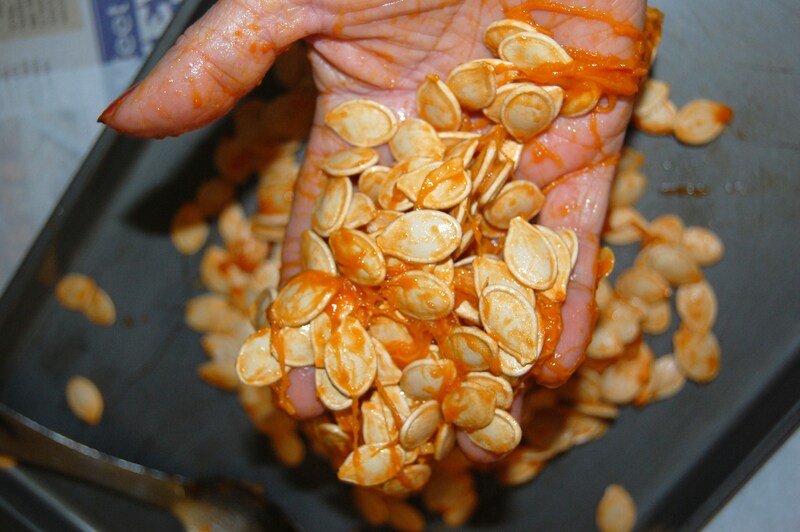 I will have a series of posts in the upcoming days about Pumpkin Mania but today I want to share a few recipes with you. You can find the full range of recipes from 2-3 ingredients like my Pumpkin Muffins and Seeds to the Pumpkin Mousse which is a little more time consuming, but worth it. 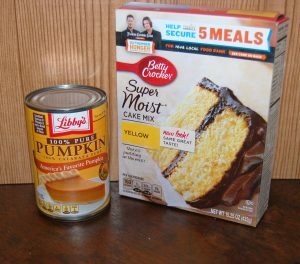 Oh, and please remember, I’m not a huge pumpkin flavor fan, but a few of these I have tried and liked. But please, don’t even think about mixing pumpkin with my coffee. 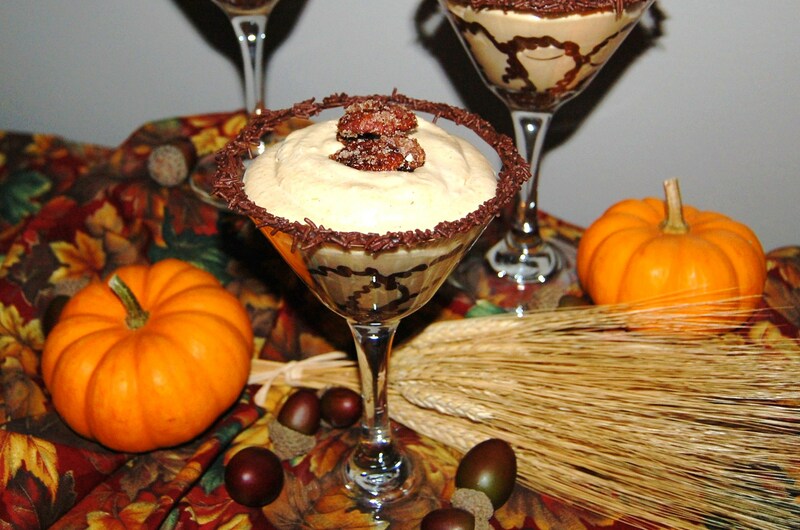 Do you remember my Pumpkin Mousse recipe from a few weeks ago? Please give it a try. Not only are these good for you and taste good, but very simple to make and can be flavored in many ways. 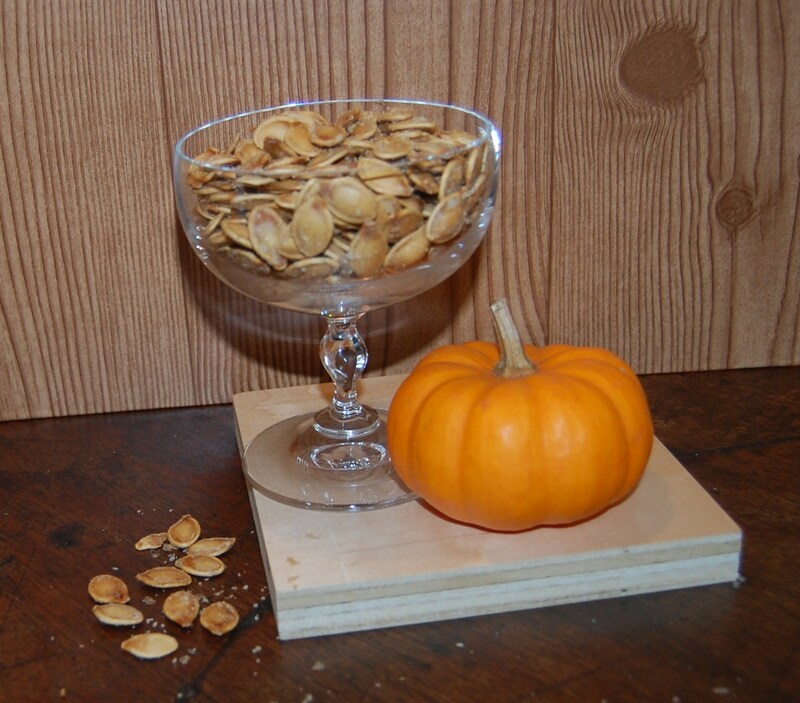 The yield and size of seeds you get will vary depending on the type of pumpkin and size. I chose the basic medium size pumpkin most popular for carving and decorating. This gave me about 1 2/3 cups of seeds. I put some newspaper and parchment paper to cover the table because I can be messy at times. 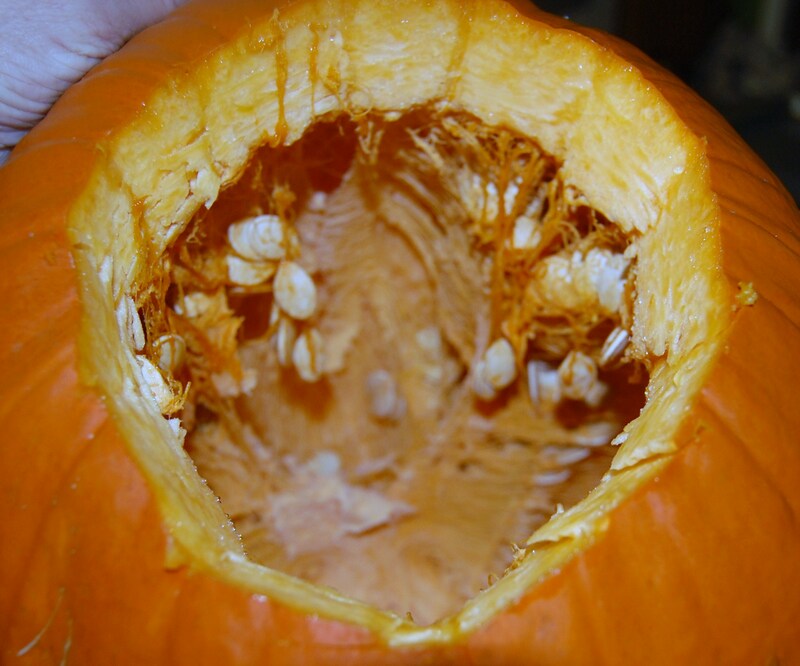 Start by cutting the top out of your pumpkin at an angle. This makes removing it easier. Make sure you knife is sharp. More accidents and cuts occur with dull knives than sharp. Now the fun part begins. 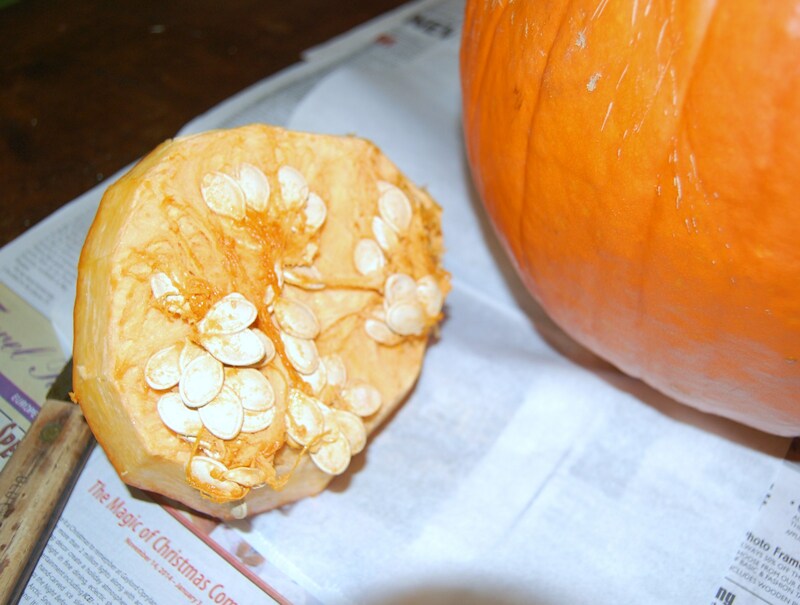 You want to remove the seeds from all of the “guts” and membranes of the pumpkin. I tried using a heavy spoon, but found that using my hands worked best. As I pulled them out, I just placed them on a baking sheet. Don’t forget to get those attached to the top also. After getting all the seeds, I removed as much of the pumpkin pulp I could from them, then rinsed them a couple of times in cool water. After placing them in a colander, I ran cool water over them for about a minute to finish rinsing. I put these back on my baking sheet, which I had covered with several layers of paper towels and let stand for about 5 – 10 minutes. These seeds love paper towels – they really stick to them. I then put them onto a dry dish towel for further drying. 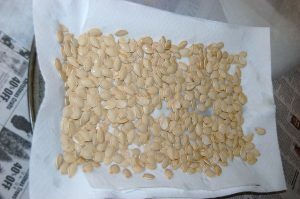 I massaged the seeds with towel to get them fairly dry and let them stay wrapped in the towel for another 5 – 10 minutes. As they were drying, I made my seasoning. 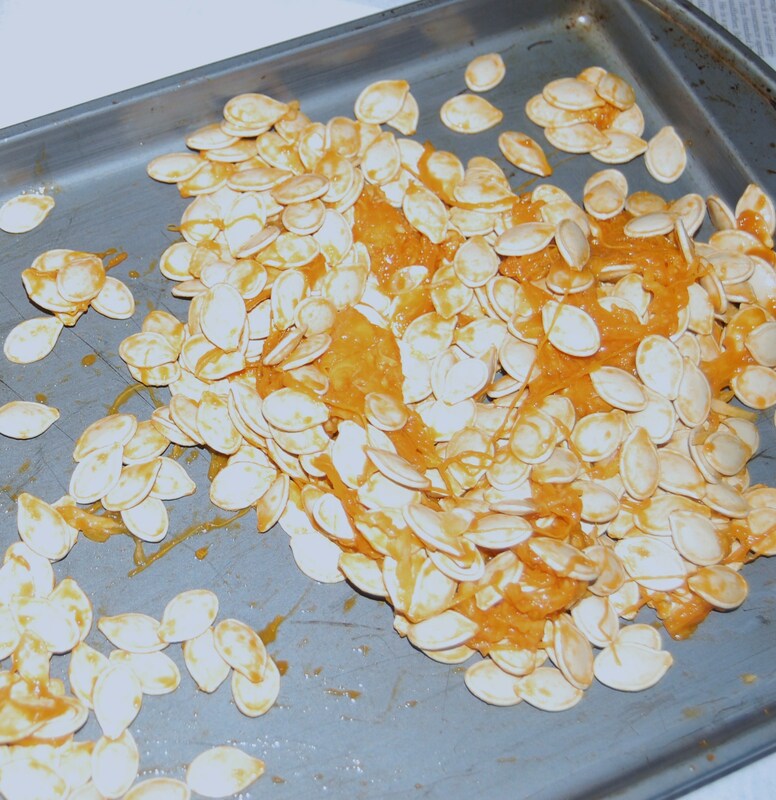 In a medium mixing bowl, mix the oil and salt together then add your seeds and toss until all are coated. 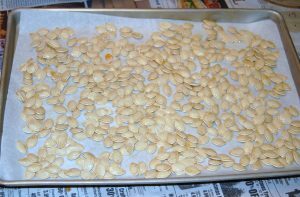 Spread these seeds onto a parchment lined baking sheet, trying to get them into one even layer. Bake these for 1 hour at 350, or until they start turning a golden brown. 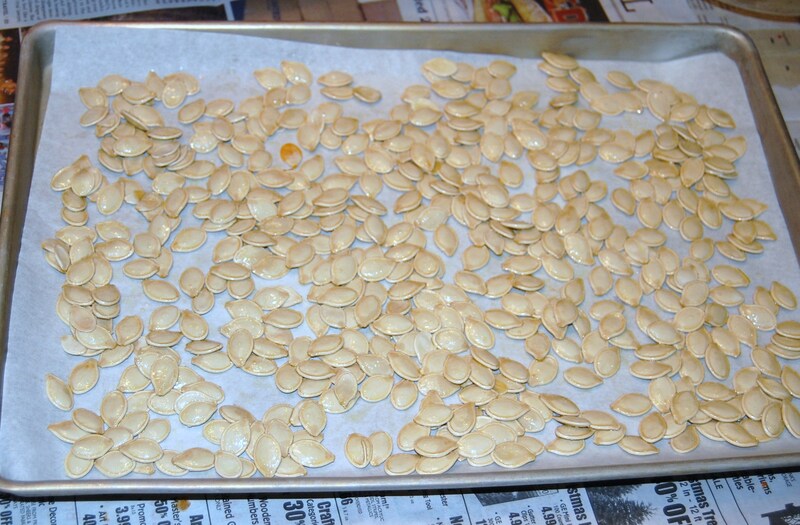 Every 15 minutes, stir the seeds so they will toast more evenly. After baking, remove from oven and turn onto another baking sheet to cool. When completely cool, stir in an airtight container. Do you like other flavors? All of these are adjusted to your own taste and likeness. You won’t need more than 2 – 3 tablespoon in total for any of these. You can also use melted butter instead of olive oil for a little different taste also. A mixture of cayenne pepper, smoked paprika and sea salt. Any of these are great to eat as a snack, add as a topping to yogurt or oatmeal, or make a big batch and share with your friends as gifts. 2 ingredients – anyone can make these, even a self proclaimed non-baker. Plus these can be made start to finish in about 20 – 25 minutes. Let the kids help out on this easy muffin. Preheat oven to 350. This made 18 muffins. Place paper liners in muffin tins or spray well with non-stick cooking spray. Mix these two together on a medium speed with your mixer until well blended, about 2 – 3 minutes. Or it’s so easy you may just choose to do by hand. This is a very thick batter. Fill each cup about 2/3 full. I use the large scoop from Pampered Chef for all of my muffins and cupcakes. It’s the perfect size. 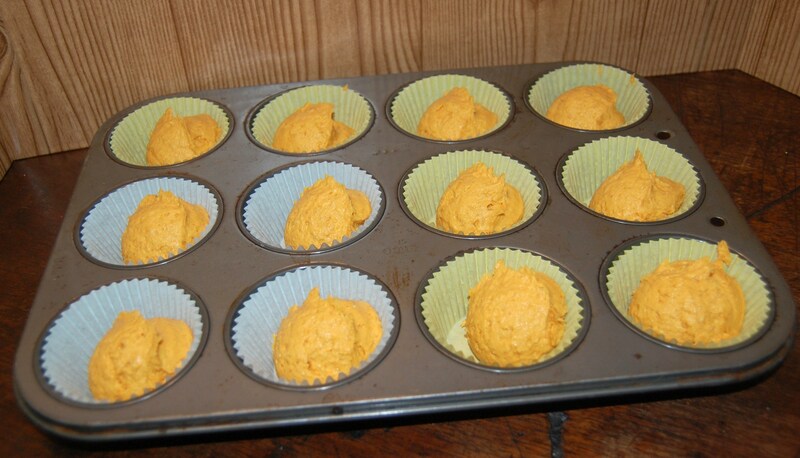 Remove the muffins from the tin and cool on a rack depending on if you are adding a topping to warm or cool muffins. 6 T pure maple syrup, there is a great difference in pure and artificial flavored. Fry the bacon until crispy. Cool then break or chop into small crumbles. In a medium size bowl, whisk the sugar, syrup, and milk together until completely smooth. Any lumps should be able to be removed by whisking. You can add more milk if you would like a thinner glaze. Just add a few drops at a time. 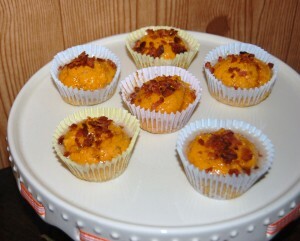 Spoon about a teaspoon of the glaze onto each cooled muffin then top with bacon crumbles. You can store these at room temperature for a day. After that, I would refrigerate any leftovers if they last that long. Here’s a few topping ideas if you don’t want to serve them plain. 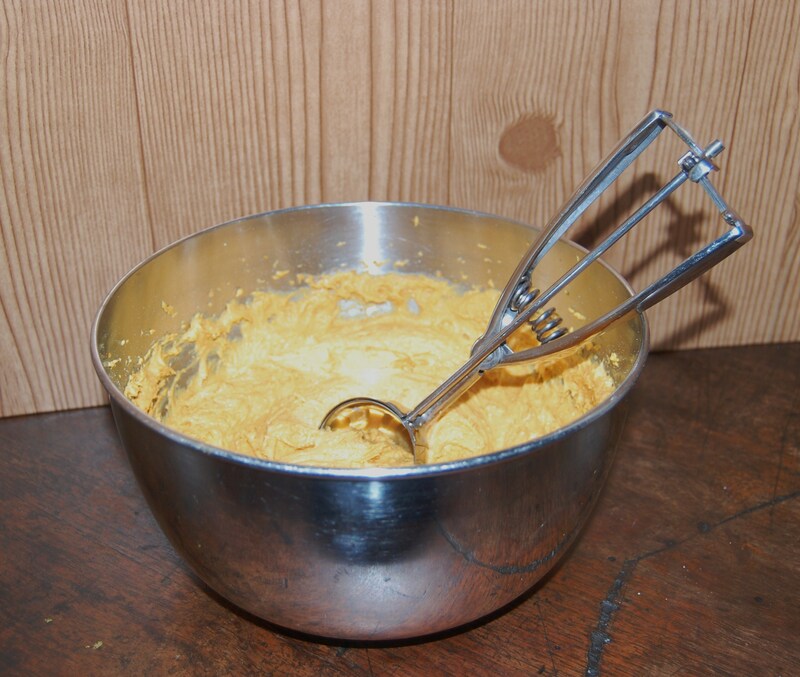 Using your electric mixer, beat the cream cheese and butter together, until well mixed. Add sugar, vanilla, and cinnamon and continue beating until all is smooth. Spread the glaze onto muffins, whether you want them warm or at room temperature. These all look great! I love all things pumpkin, so I may have to try one of these. You should do the easy muffins with the boys. 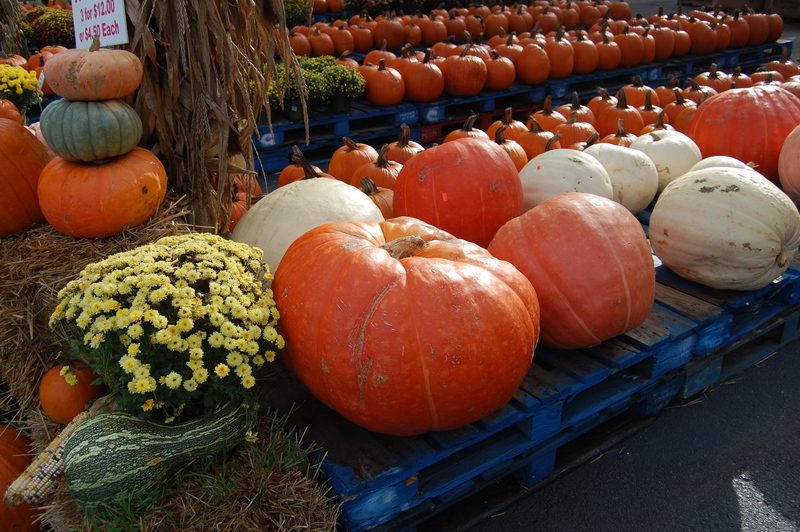 They were ok to me, but then I’m not a huge pumpkin lover. Maybe if I covered them in chocolate.